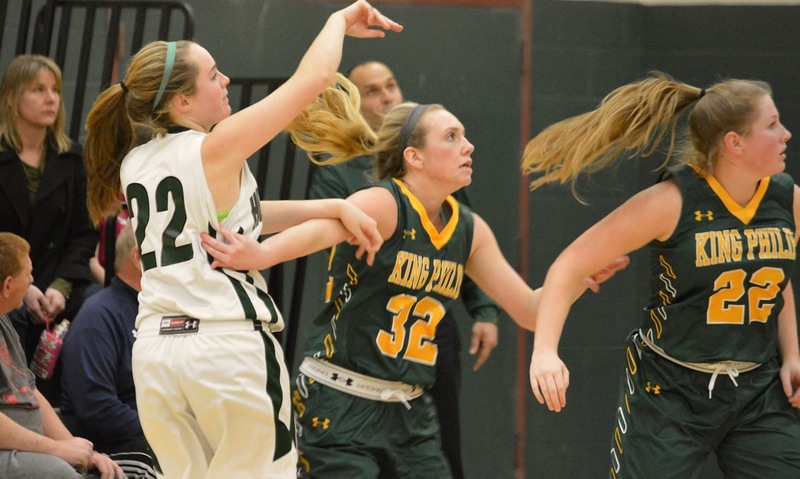 SMITHFIELD, R.I. – King Philip has prided itself on its defensive effort in the past couple seasons and on Saturday night the Warriors went into Smithfield (R.I.) and held the Sentinels to just 37 points. Unfortunately, the offense is still a work in progress. 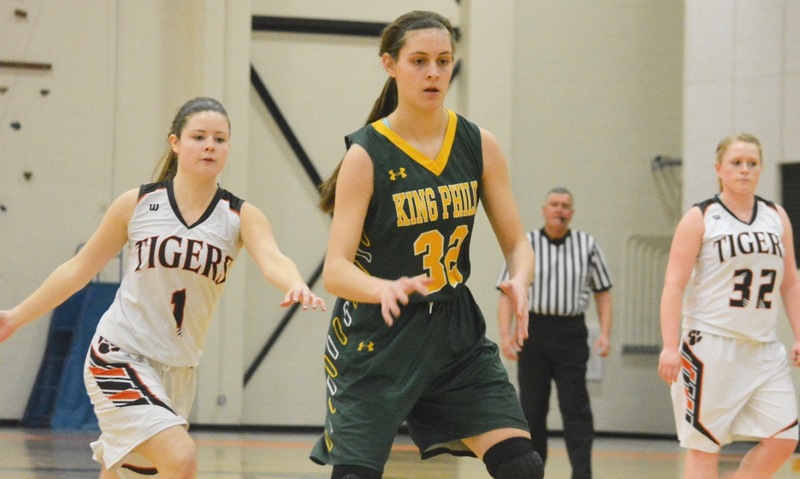 KP only scored 10 points in the second half and none in the final five minutes in a 37-34 loss in the opening game of the Smithfield Holiday Tournament. The Warriors led 24-20 at the break and Sam Madden hit a layup that extended the lead to 27-22 early in the second half (Rhode Island uses halves not quarters). Freshman Julia Leroux had a steal and a fast break bucket that made it 29-23. 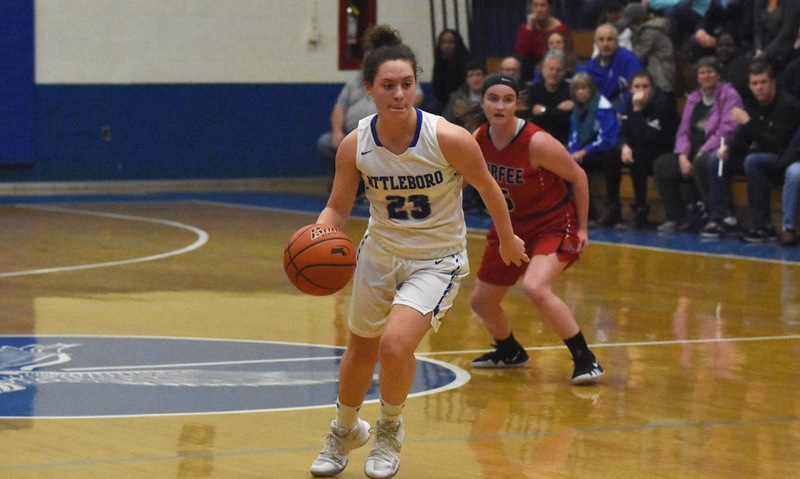 The Sentinels battled back with baskets by Julia Mitchell (six points) and a layup by Michaela Dolan that cut the lead to just two, but then Leroux (team-high eight points) stepped into a three-pointer off an assist by Maddie Purdue that kicked the lead up to five. The game turned into a war of attrition for the final 10 minutes with neither team getting any flow going on the offensive end. KP would go five minutes without a basket until a jumper by Olivia Dort with just over five minutes left to play. It was the final basket for the Warriors. On the other end, the KP defense was keeping it in the game. Purdue had blocks on consecutive Smithfield possessions, Rylie Dalzell, Madden, and Leroux each came up with several steals. Despite going through a fallow stretch on offense, Dort’s jumper still had the Warriors up by five (34-29). Those missed opportunities did eventually hurt the Warriors. 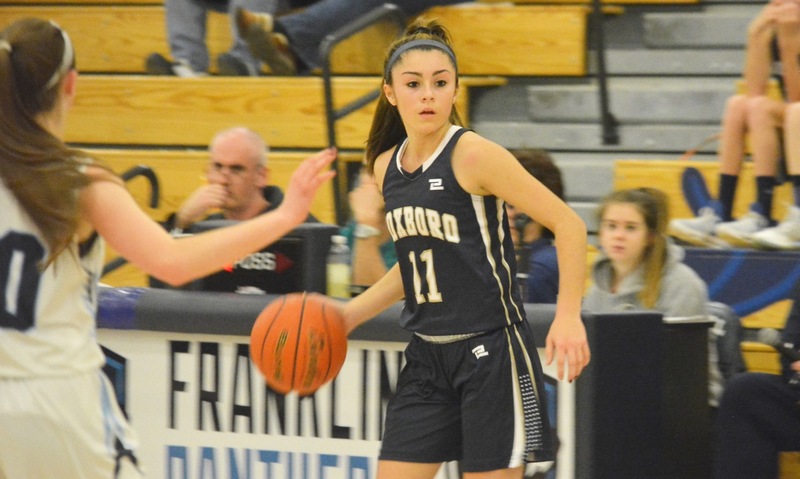 Juliana Romeo scored a traditional three-point play on a drive to the basket for the final three of her game-high 11 points to make it a two-point game and then Mitchell scored on a put back to tie it. “If you let scrappy teams hang around then they’ll beat you in the end,” said Crowley. That proved to be the case, as Taylor Deming (10 rebounds) got free in the corner and buried a jumper to put the Sentinels ahead by three inside the final minute. The Warriors would still have several possessions to try and tie it, but on both attempts they turned it over without getting a shot off. 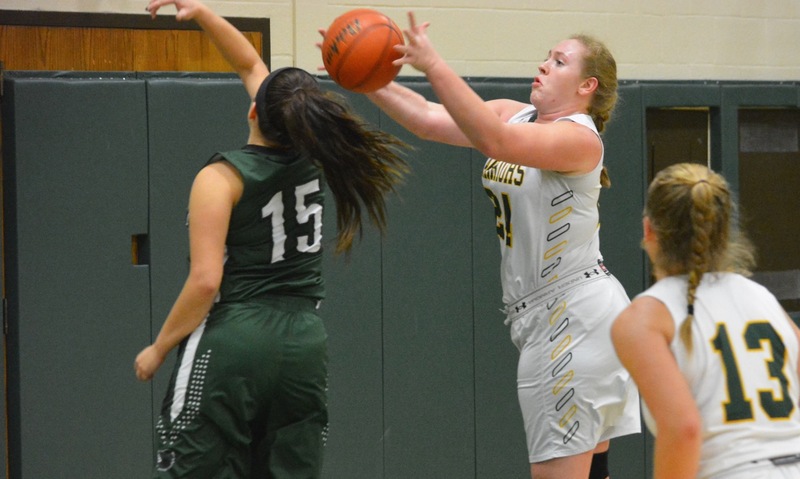 In the final five seconds, Smithfield missed the front end of a one-and-one and freshman Shannon O’Connor (six points) pushed the ball up court and had a look but it was off target. The first half was far from a shootout with both teams struggling from the floor. Leroux knocked down a three to make it 11-9 before Smithfield went on an 8-0 run. KP answered right back with a 10-0 run of its own. Jen Lacroix started it with a corner three then added a layup and a couple of free throws. In the middle O’Connor buried her second three-pointer of the half. Dort added a three-point play to close out the half with the Warriors in front. KP (0-4) will have little time to dwell on Saturday’s game. 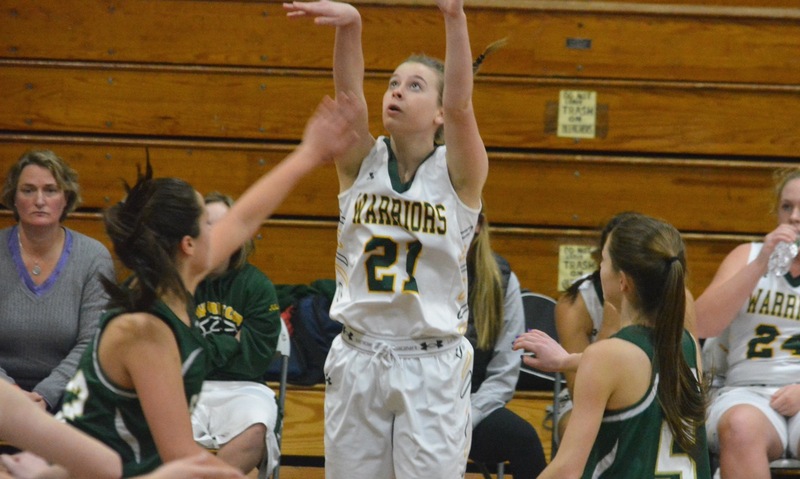 The Warriors will be back on the court against Cumberland (R.I.) on Sunday, also at Smithfield High.